Previous speakers made from glass have tended to sound rather brittle and bright, but then the construction of a glass speaker is an extremely bold move. Not only is the production process highly complex and expensive, but there are also serious sound quality concerns. But, by incorporating sophisticated damping techniques, Waterfall has refined the process to the point where its latest Evo range is in no way compromised by the material itself. Instead, what you get is a distinctive speaker with the positive benefits of glass, such as high density and rigidity. The question is, can function truly benefit from form? All sides except the bottom are made from tinted, six millimetre glass with bevelled edges. The glass panels are bonded together to form the cabinet. A secondary front baffle adds an art deco-style motif, additional rigidity and improved damping. At the base is a die-cast aluminium plinth that not only anchors the cabinet, but also acts as housing for the crossover, passive bass unit and spikes. The crossover is generally of a high quality, if conventional construction. Although not bi-wireable, it features expensive components such as polypropylene capacitors and insulated inductors. Less impressive is the line of block connectors that link the crossover to the drivers' cables. Of note is the Acculinear treble filter. The special type of plastic used in this filter is designed to improve treble smoothness and is just one of the ways in which Waterfall counteracts the natural sonic tendencies of the glass cabinet. A metal plate not only hides the crossover from sight, but also protects it from standing waves; yet another example of function benefiting from form. All four drive units are made by the French company, Atohm. And, in case you were wondering, the fourth drive unit is an ABR passive radiator at the base of the cabinet. Made of ribbed, moulded plastic, the most intriguing feature of this ABR is the bolt-on weight system. By attaching the supplied weights you can, literally, add mass thereby tuning the bass response. Naturally enough, extra weight increases bass weight, but restricts the speed of response. Both woofers are more conventional, although their die-cast aluminium chassis is extremely well-vented. This usually gives higher power handling and a wider dynamic response. Of more interest than the woofers themselves is the way in which they are mounted. What Waterfall calls ADT (Acoustic Damping Tube) effectively amounts to a woofer sub-chassis. Made of die-cast aluminium with an open mesh at the rear, ADT has several advantages. It damps the rearward travelling airwaves so they don't become too 'excitable' within the glass cabinet. Combined with this is a certain amount of isolation from standing waves within the cabinet itself. It also mechanically isolates the woofer from the glass cabinet by acting as a sophisticated gasket. It's the effectiveness of this technology that will really test the Waterfall's ability not to sound brittle. The tweeter features a silk dome protected by a metal mesh grill. The die-cast rear plate should help isolate it within the cabinet much in the way that ADT works with the woofer units. That's the technology, then. how well it is implemented and how competently it stands up to the competition is another matter. Take the materials out of the equation and the Victoria Evo is still an extremely well finished speaker. Block connections aside, the design impresses with its thoughtful and thorough build. The way that the neat internal speaker cable routing actually adds to the design – resembling the strings on a cello – is a case in point. Then consider that the speaker is made out of glass and the design becomes more impressive still. There are no sharp edges or awkward angles, just an immaculately finished piece of industrial design that's good enough to win design awards. The tinted glass with semi-mirrored finish and bevelled edges is of the quality usually reserved for expensive Italian glass furniture. Make no mistake, the Victoria Evos are speakers you'd be proud to have in your living room. 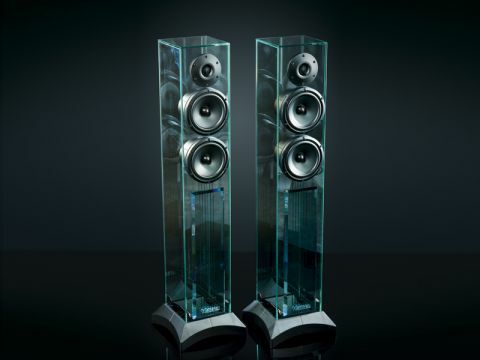 Although the quality of finish can't be questioned, the speakers' value for money possibly can. Rival speakers that offer similar component quality and cabinet size tend to cost around £2,000. The PMC FB1i, Opera Seconda and Proac D18 are all exceptionally fine sounding speakers with the Opera, in particular, also expensively finished. None have any serious sonic vices and all will sustain several system upgrades before they get out of their depth. If the Victoria Evos are to justify their additional £700 they will have to offer some sonic benefit over and above their unique looks. The first listen came as a great relief. With claire Martin's, Man in the Station, I wasn't overwhelmed by an overly bright balance or excessive vocal sibilance as I had feared I might be. In fact, Waterfall appears to have suppressed the natural tendency of glass to ring so well, that the resulting balance and natural harmonics would embarrass many a conventional cabinet. Whether male or female, the vocals are especially well-articulated with excellent projection into the room. If anything, there is a slightly forward bias to the speakers but it's not relentless, and it's more explicit and revealing of the music. Whatever the genre, the Evos are particularly adept at expressing and layering it. Only at very high levels does a little congestion set in and even then it is mild. Turn up the tempo and the Waterfalls respond admirably. A crisp, dynamic response provides excellent timing, and matching that faultless timing, is an expansive soundstage that competes with the best in its class, not just for width but depth of sound, too. Very deep bass is a little lacking, yet this doesn't diminish the Victorias' zeal in ripping through the music with conviction. Classical music reveals a surprisingly sweet violin timbre. The combination of silk treble unit and Acculinear filter certainly appears to have done the trick in providing a well-integrated and smooth treble response. Perhaps, as a result of this, the balance occasionally sounds just a little too smooth. Some of the 'space' around instruments seems lost. I suspect that a decent ribbon or panel would pick out a little more detail in the high end. Nevertheless, the Waterfalls do a good job in staging the orchestra and its taut timing ensures that a sense of drama and scale is always maintained. That the Waterfalls look striking and are exquisitely constructed can't be denied. Given the unusual construction, their sound quality is impressive, too. Despite some minor criticisms levelled at frequency extremes and a slight congestion of sound at higher levels, the Evos sound engaging, well-integrated and just as adept with a full scale orchestra as a female vocalist. In short, these are the type of speakers that will happily 'hook' you in for a full night's listening. Yes, a handful of slightly cheaper speakers can match the sound, but none are as visually arresting. Clearly, these are the perfect speakers for the design-conscious audiophile.